This class provides insight into the Tarot, for beginners looking for an entry point, and for more advanced readers looking for deeper discussion and exploration. Using the Small Spells deck, we will break down the structure of Tarot into more accessible and inter-connected numerical groups and elements, and explore ways to incorporate your own intuition into a reading. We will go over all the cards, discuss spreads, and bring in other esoteric tools, all to expand your Tarot vocabulary and get more in tune with the cards. Rachel Howe runs Small Spells, a multi-dimensional brand, joining healing and the arts. She provides inspiration and healing through private tarot readings and reiki sessions, as well as regular astrology posts and channeled messages on her Instagram feed, @smallspells. Her work empowering others to find their way to healing also takes the form of teaching regular workshops on tarot and accessing intuition. 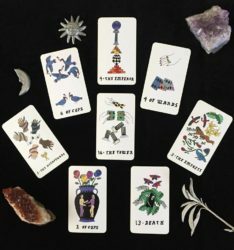 In 2016, she designed and released the Small Spells tarot deck. Reaching a broad audience through her illustrations that embrace mysticism while staying firmly rooted in the culture of modern design – drawing on the imagery of cartoons, tattoos, handmade illustrations and low-fi graphic design, she has found a voice that is both accessible and aspirational. Based in Los Angeles, her aim is always to lift up those around her, to raise the level of communication and self-awareness, and to enable personal healing and growth to occur.